Big sound from a small box, with enough connectivity to please nearly everyone. That's what Bose's SoundTouch line of speakers offers, and the flagship of the series is a remarkable unit, indeed. SoundTouch products have been out for a few of years now; I first experienced them at their introduction in New York back in 2013, and such is their quality and design that they're still on the market today. That's unlike the remarkable SoundDock 10 iPod dock speaker system that was my first "modern" experience with Bose - modern meaning within the last 10 years, since Bose itself has been around for more than a half century. I remember Bose' SoundDock 10 introductory demo well. The company had set one up behind a Wizard of Oz-like curtain in a private room in a Manhattan restaurant and kicked off the demo with some really great-sounding rumbling thunder. I said then that the demo came "complete with bone rattling realism that sounded as if it were coming from an 'honest to goodness' audio system with big speakers and big amplifier power." A while back I got to wondering if Bose had added any new features to the SoundDock 10 - specifically, I was looking for better connectivity options beyond its auxiliary input and the optional Bluetooth module I'd been using in place of an iPod docking mount. So I surfed by their website and, much to my surprise and chagrin, I noticed that Bose no longer offers the SoundDock 10 for sale at all! Not to worry, however. Before I broke into tears, my contact at Bose reminded me that the newer SoundTouch series not only offers the Wi-Fi and Bluetooth connectivity I was seeking, but that the top line SoundTouch 30 actually uses the same audio engine that was in the wonderful SoundDock 10. So I begged them to let me review one. I don't know if the $499USD ($599CAD) SoundTouch 30's guts are exactly the same as the SoundDock 10's, but have no reason to think Bose would be lying. They don't have to spin its performance anyway: after spending some weeks with the SoundTouch I can attest that it does sound as good as the Dock10 - and that's high praise indeed. The SoundTouch 30 only has a footprint of 9.7" H x 17.1" W x 7.1" D, yet the thing weighs a comparatively whopping 18.5 pounds, so either there's a little cinder block in it or Bose has put in some "heavy" duty components - and judging by the audio quality, I tend to think it's the latter. Further upping the ante from the SoundDock days, the SoundTouch 30 also comes with an OLED display (monochromatic - which is all that's needed in this application) that will read out your audio source, song title, album, artist, etc. It's pretty small and so I can't read it from across the room, but it's no worse than many other such displays - and you can set it to have a clock readout when it's turned off, which is kind of handy. I guess Bose wants its owners to have a good "time!" Besides adding more connectivity to the equation, the SoundTouch system means you can also exploit (and probably should, since the unit exploits it so well) the Bose SoundTouch app, which not only interfaces between your computer and the speaker but which also lets you control the speaker from your various smart devices. And if you have more than one SoundTouch unit, you can control any or all of them from the app. I had problems getting the system to access my iTunes library, but that's more because my library is such a dog's breakfast of files and locations that iTunes tends to throw up its little virtual hands in disgust whenever I fire it up. I blame Steve Jobs for this. It accessed my tunes fine on its own, though, the app accessing the files directly via my home's Wi-Fi network. 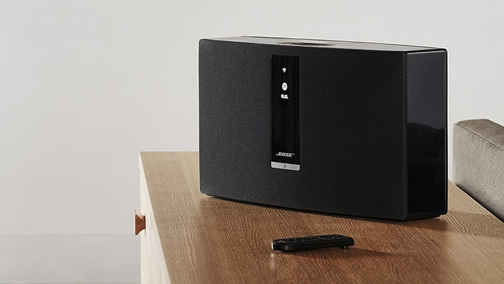 Bose says the SoundTouch supports all MP3, WMA, AAC, FLAC, and Apple Lossless audio formats, which is pretty good mainstream support, though if you want to play "ultra-high resolution" audio files such as SACD and DVD-A you're out of luck. Those aren't really typical formats, however - unfortunately - so most people shouldn't be bothered by the incompatibility. The SoundTouch's remote control is a bit bigger than the SoundDock's, but it also includes duplicates of the six preset button that are mounted on the unit's top (and into which you can store your favourite playlists, online services or whatever). It also has "up/down" vote buttons you can use for expressing your opinion of a particular tune or whatever, as well as volume control and track skipping buttons. There's also one that selects between your audio sources. I didn't think I'd care about the preset buttons, but I love them! Not only can I store a couple of my favourite online radio stations into it - meaning I can access them directly without having to fire up a separate online radio app such as Tune-in - but I could also earmark (no pun intended) a preset that lets me play randomly every tune stored on my remote hard drive whose file format it recognizes (which, fortunately, is most of them). In effect, this single preset has given me "the mother of all playlists." One of these days I'll cull the duplicate files to create an even better list, and maybe set up some others by theme, but I'm not in a hurry to do that since I can just skip ahead a track when the SoundTouch starts playing something I don't want to hear right then. It works well. The system is thought out so well that you can have multiple SoundTouch speakers (they have a whole line of them, of varying sizes) in different rooms, and each can play a different source if that's what you want. Setting up the SoundTouch 30 is easy, once you get past the first step. And to be fair, that first step isn't too onerous either: you download and install the Bose app onto your computer, hook the speaker into the computer via USB and register it on the network. Once you've done that you can unplug it from the computer and move it to where you want to use it normally. You can also name the SoundTouch (any of them, not just the 30) whatever you want ("Jim's excessively messy office," or "dungeon" for example), as a way to keep track of which unit is which. Services the Bose will let you access right out of the box include Spotify, Pandora, Deezer, iTunes, Internet radio, Sirius XM and iHeart Radio. Naturally, you'll need subscriptions to some of services if you don't have them already. The 30 plays as loudly as I could possibly want it to in my living room, and it likes being cranked (most Bose speakers I've tried are like this). I played every type of music I own while researching this review and, as usual, the Bose doesn't seem to care what you're playing. Obviously, it's a case of "garbage in, garbage out" - just like with any other audio system - in that the better quality the source you're playing the better quality the sound emanating from the SoundTouch - but other than that the speaker seems happy just to perform, whether it was classical, rock, show tunes, whatever. Indeed, if the original file was good, the Bose reproduced it with wonderful fidelity. I also used the SoundTouch 30 to play back some TV and video, and it was fine there as well, though I think it would have been even better if Bose had seen fit to put an optical digital input on the system as well as the little 3.5 mm stereo auxiliary input that is there. The SoundDock 10 had the same minor issue, however, and since the folks at Bose are pretty clever it strikes me that there may be more involved to adding such an interface than I know. But because there isn't an optical input available, when I wanted to play various TV/video source sounds through the Bose I had to run the devices (satellite TV receiver, Roku Ultra, and Oppo 4K disc player) into the TV via HDMI first and output the TV sound to the Bose via an optical-to- analogue converter I hooked into an RCA-to-3.5 mm stereo adapter plugged into the Bose's auxiliary input. It was more complicated than I like, but it worked - though when listening to TV, or sources passing through the TV, the sound wasn't as loud or as dynamic as when I sent tunes directly into the Bose. Since the SoundTouch 30 sounded great with sources that weren't routed to it in a Rube Goldberg-type of manner, I blame the optical/analogue adapter and kick myself for having bought a cheap one. Bottom line for the Bose SoundTouch 30? It really does offer the same great sound quality as the SoundDock 10 it replaced, while adding the connectivity today's marketplace demands. That's just what I was hoping for.